Life by the Creek: Goodbye, April! 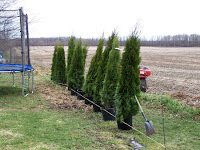 First, we decided to plant 14 cedar trees for Earth Day!! :D Actually, we wanted them for a privacy hedge, but it worked out that we planted them on Earth Day. Aren't we environmentally friendly? Next, we had to go and see our newest little nephew. My sister gave birth to this beautiful boy, named Wesley, on the 21st. 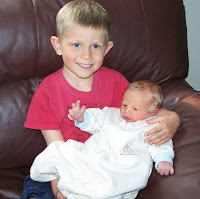 Here is Michael and Wesley. Awww... too cute! Last weekend, the 24th and 25th, was the OCHEC conference in Hamilton. I went with my mom and two sisters. Despite no sleep and strep throat, we had a good time. 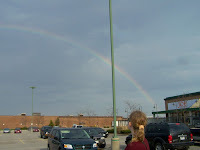 And, on the way home, we were treated to a beautiful rainbow. Jeff has a new toy! 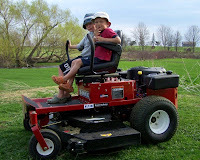 We decided to bite the bullet, and go ahead and get a bigger mower. We went with a Swisher 60" zero-turn. Wow! This thing is incredible! It's amazing what a difference a few more inches make. 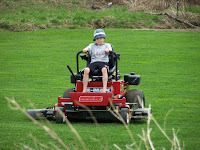 With our regular 42" lawn tractor, it took almost three hours to mow the grass at Creekside. With the swisher... it took less than an hour. Craziness. That alone makes it worth the cost. 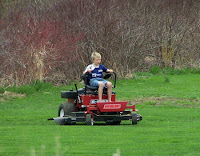 We'll still need to mow the fenced yard, and along the driveway with the lawn tractor, but everything else will be swishered! ;) Including some more of the unusable field where Creekside is. Slowly but surely we're reclaiming it. The plan is to plant some fruit and nut trees there for our own little orchard. 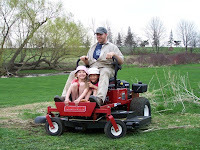 And, daddy let the youngest two have a ride up to put it away. They loved it! So, that's how the end of April has gone for us. See you in May! love, LOVE how green everything is!!! And I like how you change your poster of the creek for the seasons. April did go incredibly fast, didn't it? Woo woo! Green is awesome. I love green! It's very soothing, apparently. Bring on the flowers! And the dry ground, so we can go camping! Hopefully May goes by as quickly as April, because then I will be OFF WORK!! Yah!